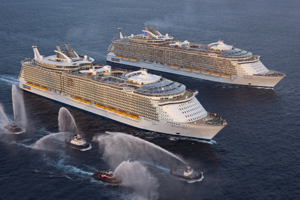 Royal Caribbean has confirmed that negotiations are in place for a third Oasis class ship, their increasingly popular class of über ships. Richard D. Fain, Chairman and CEO of RCCL, said to Cruise Critic "While the company has not entered into any agreement at this time, it hopes to do so before year's end... The Oasis of the Seas and Allure of the Seas have proven themselves to be exceptionally attractive ships by generating the highest guest satisfaction ratings in the fleet coupled with very compelling financial returns." This is a change in direction for Royal Caribbean as they previously announced they wouldn't be adding to the Oasis class ships when they confirmed their order of two new ships — currently under construction in the Meyer Wreft shipyard in Germany. The ships currently on order are 158,000 tonnes and carry 4,100 passenger ships, which is much smaller than the Oasis class as Royal felt they needed a change in direction and to offer something new. . The return to the Oasis class ships shows there is a real thirst for these 5,600 passenger super ships, which truly offer a world class, floating resort feel. If a contract can be agreed, the new ship would be expected to arrive in 2016.